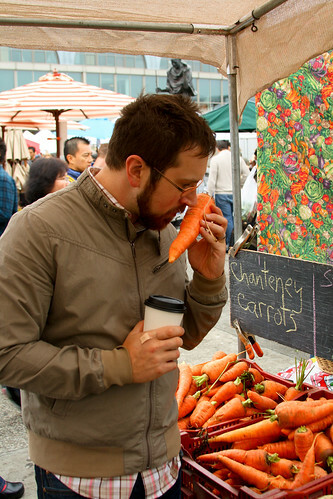 When I dream of San Francisco, it is more often than not about the Ferry Plaza Farmer’s Market. While Michigan ranks highly in agricultural diversity despite our relatively abbreviated growing season, California’s a whole other animal. If you’re eating strawberries in January, there’s a good chance they’re from California. Same thing if you’re eating asparagus in the October. The climate is moderate and the growing seasons long, and the farmer’s market evinces this bounty. We haven’t seen strawberries in the market since late June, but they were at Ferry Plaza, as were avocados and intensely wonderful plums (flavor grenade!) and giant carrots and lavender salt and Cowgirl Creamery cheeses and so many other things that we just couldn’t buy, not with a week to go until returning home and no source of refrigeration. But first things first: coffee and breakfast. If you walk around the right side of the Ferry Plaza Market on a Saturday morning, you’ll be hit by a wave of delicious smells: roasting vegetables, frying eggs, and coffee. Coffee worth pretentious descriptions and standing in a long line. 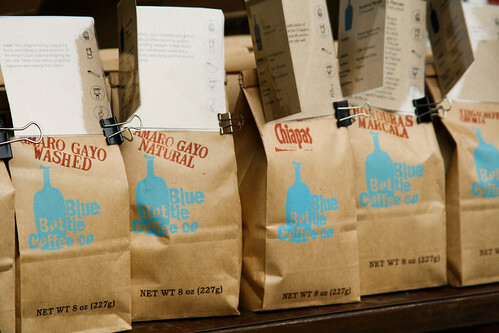 Blue Bottle actually has three locations at the Saturday market – the permanent stand in the Ferry Plaza building, plus two outside kiosks at opposite ends of the market. Shane queued up and perused the coffee descriptions while I scoped out the other locations, where the lines were just as long. Used to the pour-over options at Comet, we were a little confused when we got to the front of the line and couldn’t choose our beans. 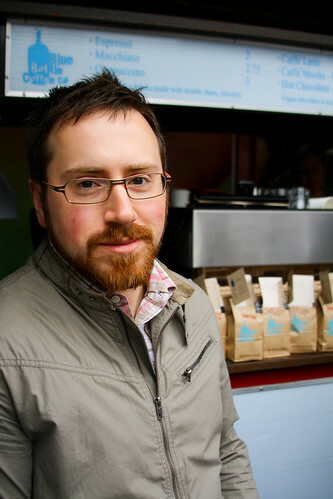 We walked away with two damned fine cups of coffee and some good advice on beans to try next time. Because oh, there will be a next time. 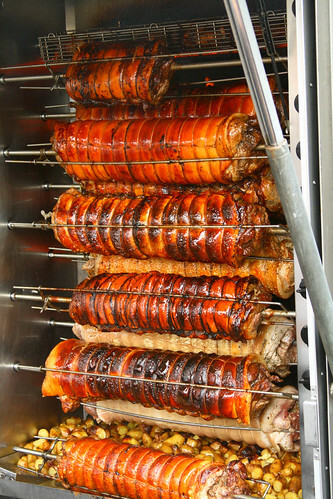 Have you had porchetta? I thought I had, but my memories had nothing on this. Using the rotisserie technique that most of us have encountered in grocery store chickens, the pork roasts slowly and evenly, and the skin turns into crisp flavorful candy. The owner, son of a Swiss Master Butcher, handed us scraps of meat as we waited in line, and we were sold. Sold sold sold. Oh my god, you guys. I know I can wax hyperbolic about food on occasion, but this sandwich! It really might’ve been the best sandwich either of us have ever had – and remember we live in the land of Zingerman’s. The pork was moist, herb-infused and intensely flavored, with a fair portion of crispy skin. 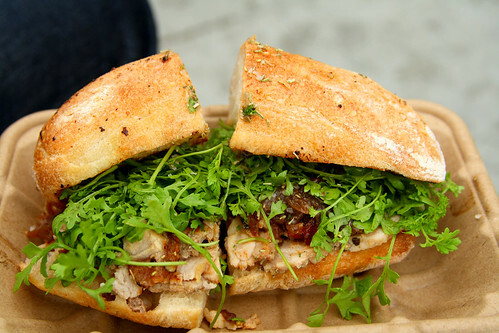 On top of the pork, crunchy greens and some sort of jammy onions, all of which is piled onto an ACME roll. We dug in, giving a sticky thumbs up to the owner when he called out to see how we liked it. The farmer’s market is best experienced Saturday morning (8am-2pm), though it also runs Tuesdays and Thursdays from 10am-2pm. In addition the Ferry Building has many permanent vendors and restaurants, including Cowgirl Creamery, ACME Bread Co., Boccalone, Sur La Table, and Slanted Door. RoliRoti is in the running for The Great Food Truck Race – they’re not on the show currently, but might be on a subsequent season? I’ll admit to making a huge mess of my phone trying to vote mid-sandwich. Next > Move to SF and hate it?